In its slow ascent up Mount Sharp, NASA’s Curiosity Rover has stumbled upon a mystery fit for the robot’s name: silica. Lots and lots of silica. And the discovery may shape our understanding of the Red Planet’s geologic past, including whether life could have lived there. Silicon is one of the most abundant elements on Earth, but we hadn’t detected high concentrations of silica minerals on Mars until seven months ago, when Curiosity approached “Marias Pass,” a contact zone between two Martian rock units located near the base of Mount Sharp. It was here that the rover’s laser-firing ChemCam instrument first ID’d sediments chock full of silica, with concentrations of up to 90 percent. The discovery was so surprising that Curiosity’s science team made the rare decision to turn the rover around and hunt for more. 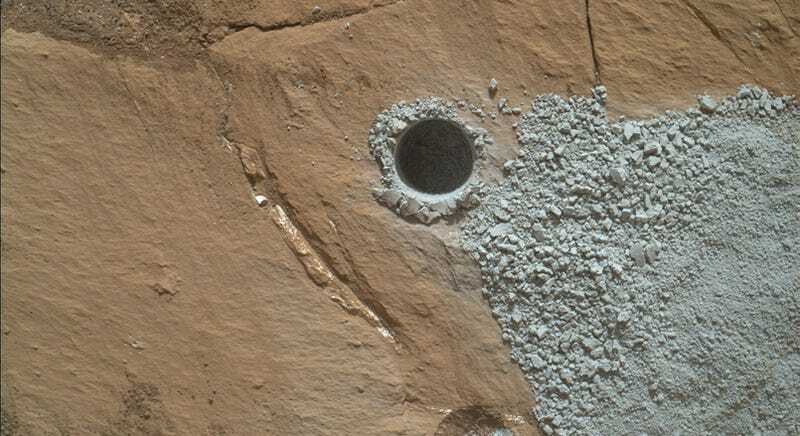 After drilling a few holes and performing elemental and mineral measurements over a period of four months, Curiosity was able to confirm silica enrichment in several different locations. To Martian geologists, this is fascinating, because not only do silica hotspots hint at watery environments, they can tell us what those environments were like. We already have plenty of evidence that ancient Mars was a water-filled place. Shortly after landing in Gale Crater, Curiosity itself uncovered a lake bed in Yellowknife Bay. As the autonomous Martian explorer travelled southwest toward Mount Sharp, we accumulated more and more evidence for ancient rivers and lakes elsewhere. All of this corroborates decades of evidence collected by prior Martian explorers, including Spirit and Opportunity. But water alone doesn’t mean that the Red Planet was once habitable. Perhaps Mars’ lakes were far too acidic, salty, or otherwise toxic to support even the hardiest microbes. That’s why we need other lines of evidence, and silica hotspots are the most tantalizing new clue we’ve had in ages. If the silica concentrations we’re seeing are the result of leaching processes, during which other minerals were dissolved away, that would suggest a highly acidic environment. Then again, if silica was added to the mineral mix post-facto, it could point toward less extreme conditions. Another piece of the puzzle comes from tridymite, a rare silica-bearing mineral Curiosity detected in the Buckskin drill hole shown at the top. It’s the first time tridymite has ever been found on Mars, and, while the mineral is usually diagnostic of volcanic environments here on Earth, Buckskin is part of a fine-grained sediment deposit, perhaps an ancient lakebed. Whether that tridymite was eroded, transported and precipitated from somewhere else remains unclear. As the Curiosity rover continues to crawl up Mount Sharp and through geologic time, scientists are exploring different hypotheses for the baffling silica. But if one thing’s clear at this point, it’s that Mars— geologically speaking, at least—is every bit as complex as Earth. That alone should give us hope that life would find a way.